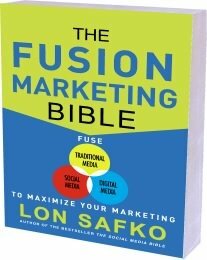 The Fusion Marketing Bible. Fusion Marketing is about “What’s next”, it’s what comes after social media. Fusion Marketing is actually an entirely new form of marketing. If you’re still stuck looking at social media as a stand-alone marketing technology, then you’ve been left behind. Today the term V.P. Social Media Marketing sounds normal, but it is already as obsolete as V.P. of Billboards. The first companies that recognize that social media marketing is only one set of marketing tools out of many, will be ahead of the curve.